(Nanowerk News) Hydrogen is a very promising storage medium for electricity that is generated via renewable sources. 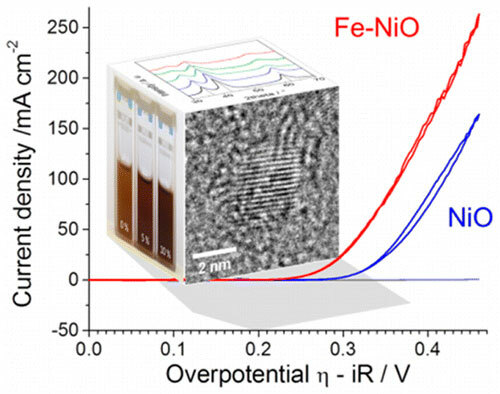 NIM scientists have successfully synthesized iron-nickel oxide nanoparticles that allows for the hydrogen production process to be ten times more efficient than existing solutions. The exceptional performance of nanoparticles in water oxidation reactions results from the combination of iron and nickel along with extremely small particle size and their high crystallinity. First author of the publication ("Iron-Doped Nickel Oxide Nanocrystals as Highly Efficient Electrocatalysts for Alkaline Water Splitting"), Ksenia Fominykh, alluded to the advantages of these nanoparticles when she stated “Conventional synthesis methods provide materials in their thermodynamically stable state. In our method, the deliberately slow reaction rate plays the decisive role as it enables the synthesis of less stable, so-called metastable phases. In our case this leads to the formation of unusual compositions of iron and nickel in the ultrasmall nanoparticles beneficial for the catalytic performance”. The characterization of the structure, particularly the iron distribution in such small particles represents a major challenge and requires advanced analytical methods. In collaboration with the groups of Prof. Christina Scheu (MPI Dusseldorf) and Dr. Ivelina Zaharieva (FU Berlin) the LMU researchers were able to fully elucidate the structure. The particles are very user-friendly and multifunctional. A special feature of the synthesis is that it provides easily dispersible nanocrystals, which is beneficial for the fabrication of various catalytically active nanostructures. For example, the particles can be applied as thin layers on any kind of electrode. Alternatively, they can be distributed as individual particles, which is desirable for the development of more complex catalytic systems. "The exceptionally high catalytic activity of our nanoparticles demonstrates the high impact of synthesis strategy and nanomorphology on the properties of resulting materials", explains Dina Fattakhova-Rohlfing. "Currently we work on the development of other nanocatalysts. In addition to the small particle size, most promising in this respect is boosting catalytic activity via the formation of defect-rich metastable phases on the nanoscale. Our main goal is to create even more efficient materials for various energy applications."